Desktop support is like a Stargate to a career in IT or higher tech. You start out fixing PC issues, then move up and up. But there's a tidal wave of applicants between you and that first desktop support job. Even worse, they've all got mountains of experience. Your desktop support resume must make you stand out like Scotty on the Enterprise. It has to show unique achievements that prove valuable skills and qualifications. The good news? It's not hard to write a resume like that. A desktop support resume example better than 9 out of 10 other resumes. How to write a desktop support resume that lands more interviews. Tips and examples of how to put skills and achievements on an IT desktop support technician resume. How to describe your experience on a resume for a desktop support specialist to get any job you want. 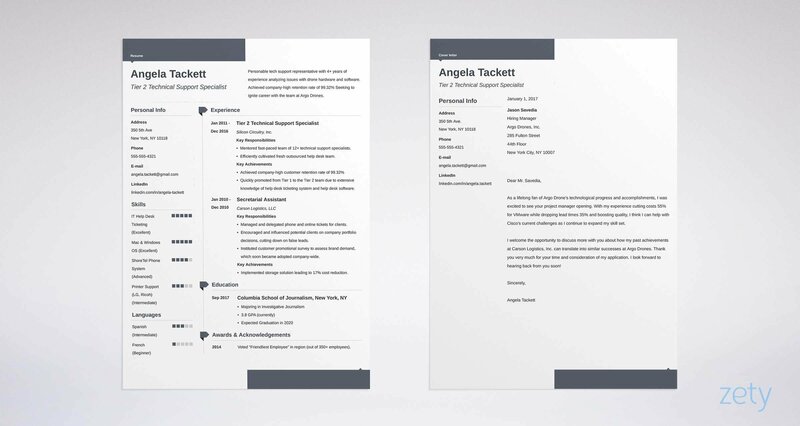 Here's a desktop support resume template made with our online resume builder tool. Desktop Support Resume Example - See 20+ resume templates and create your resume here. What's the Best Format for a Desktop Support Resume? Desktop support techs live and die by the details. So, show you've mastered them. Pick the best desktop support resume format (or be ignored like Windows 98). Choose the chronological resume format. It's best because it starts up with your most recent achievements. It'll make your support experience shimmer like a copy of Windows 2055. Use the best resume fonts (no comic sans). Inject big headings, and fall back on lots of white space to make it easy on the eyes. Finally, should you send a PDF or MS Word resume? Send in a desktop support technician resume PDF unless the job ad says not to. Applicant Tracking Systems used to system-crash on PDFs. Modern PDFs are machine readable. Pro Tip: If you're a rookie, consider the combination resume format. It lets you integrate your best help desk achievements from past non-desktop-support jobs. Picture a hiring manager named Bart. In a few seconds, his Dell Optiplex will chitter as it boots up. On it are 300+ IT desktop support engineer resumes. He'll spend just six seconds on each one. The ones he really likes will get a closer look. Get into that pile with a good desktop support resume summary or resume objective. Which is which? And which one should you use? 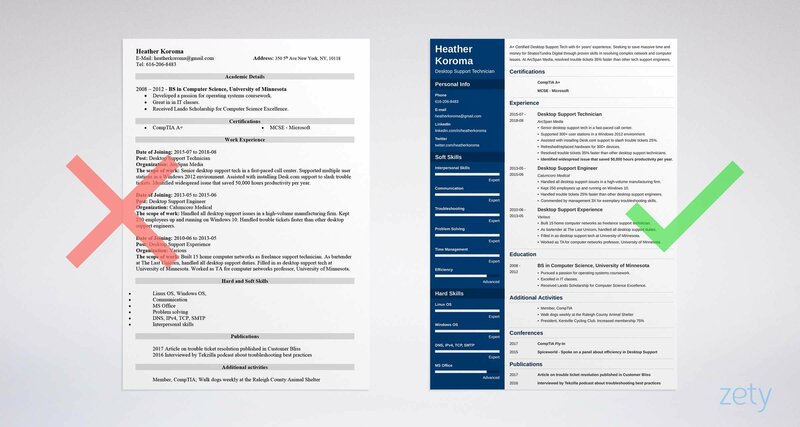 A resume summary works for those with Gigabytes of experience. Use it if you've been around the block (and sector) a few times. Either way, list enough accomplishments to get hired as tech support for Star Lord's mask. See the senior technical support resume samples below for help. Senior desktop support technician seeking new position. Have fulfilled all duties and responsibilities for desktop support jobs in two companies over six years. Excellent interpersonal skills. 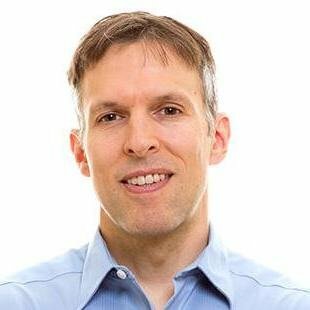 Adept at resolving complex network and computer problems and handling trouble tickets fast. That's not exactly the Blue Screen Of Death, but it won't core dump a hundred interviews either. A+ Certified Desktop Support Tech with 6+ years of experience. Seeking to save massive time and money for StratosTundra Digital through proven skills in resolving complex network and computer issues. At ArcSpan Media, resolved trouble tickets 35% faster than all other tech support engineers. With that summary, you could get a job as help desk tech for Tony Stark. Is your experience more like a newly-formatted drive? See the entry-level desktop support technician resume examples below. Junior desktop support engineer, seeking entry-level support job. I haven't worked yet in professional desktop support jobs yet, but I've got great interpersonal skills. My career objective is to grow into a full support role, handling all network and computer issues for a large and busy firm. Yecch. Like a drive fan caked in a thick hockey puck of dust. Passionate entry-level desktop support technician, seeking to raise productivity at Calumcoro Medical. Built 15 home computer networks, plus handled desktop support duties at University of Minnesota and The Last Unicorn Restaurant. Commended for interpersonal and problem solving skills. That junior desktop resume example is turned on and plugged in. After all, what is a desktop support technician? It's someone who can do all the tasks above. Don't have even that much desktop support experience? I'll show you what to do in the next section. Pro Tip: Screen companies as closely as they screen you. Years of work on proprietary systems work can weaken your next desktop technician resume. How well did you do at a job exactly like this job? Answer with a desktop support resume experience section that fits the job ad like a dongle in a USB port. 1st: Put your most recent position at the top. 2nd: Note the qualities in the desktop support analyst job description. 3rd: Find your accomplishments that match them. 4th: Add measures to your achievements. The two IT desktop support analyst resume examples below will illustrate. Senior desktop support tech in a fast-paced call center. Supported 300+ user stations in a Windows 2012 environment. Refreshed/replaced hardware for 300+ devices. Resolved trouble tickets 35% faster than other desktop support technicians. Identified a widespread issue that saved 50,000 hours productivity per year. You could get a job anywhere with that good desktop support engineer resume example. That includes the Help Desk at Barad Dur. It shows accomplishments that fit the job ad, and it quantifies them all with numbers. Supported all Windows user stations. Responsible for refreshing and/or replacing all hardware. Tasked with resolving all trouble tickets in a timely fashion. Wow. "Have you tried rebooting the Eye of Sauron, sir?" That's as generic as it comes. You need measurable desktop support achievements to stand out and get the interview. Don't have 'em? Don't panic. The two IT desktop support resume examples below will light the way. Don't have good desktop support resume experience? Brainstorm your accomplishments from past jobs. Think customer service, retail, or any time you helped troubleshoot computer issues. List experience in computer repair shops or Geek Squad jobs. Do a few hours of freelance work fixing home computers or upgrading them. Build a few computers or home networks in your spare time. Help friends with computer issues, or list all the times you have already. The two entry-level desktop support resume examples below show that in action. Desktop Support Experience: None yet but I am a fast learner. Wow. Are you sure that experience section is plugged in? Built 15 home computer networks as a freelance support technician. As bartender at The Last Unicorn, handled all computer support duties. Filled in as desktop support tech at University of Minnesota. Worked as TA for computer networks professor, University of Minnesota. If Elon Musk is hiring, that candidate should probably apply. She's got a great entry-level IT resume with no experience. Pro Tip: Are you sure you really want to write an IT resume for desktop support? Many see it as a transitory career to IT jobs. It may be easier to start in IT to begin with. You must show education on a desktop resume. That's true whether you've got a BS, BA, Associate's Degree, or just a certification. But don't just list it. That's like having Thor's hammer, then only using it to hang inspirational cat posters. Then add achievements that line up with the job offer. Imagine you're applying for a job that values operating systems knowledge and interpersonal skills. Which of these two sample desktop support resume sections would you pick? Pursued a passion for operating systems coursework. Excelled in Interpersonal Communications classes. Received Lando Scholarship for Computer Science Excellence. That's a great desktop support specialist resume example. It could get you in as tech support on the Death Star. Completed all core computer science coursework. Hmm. Looks like a problem between the computer and the chair. But add back the details and you're 100% upgraded. Pro Tip: If you learned a programming language in school, show it on your resume for desktop support. It works even better if you used it in a project. Let's look in on our hiring manager, Bart. His curvy ultrawide monitor shows a folder with 300 desktop support resumes. They all show a skills list as long as the Linux source code. Yet very few of them can walk the talk. Let's say his job description advertises Windows 10 support, speed, and troubleshooting. Which of the two help desk desktop support resume examples below would you rather show him? A long skills list isn't bad. But it buries the important ones behind the unimportant ones. Instead, focus on the skills shown in the desktop support job description, plus a couple more. Handled all desktop support issues in a high-volume manufacturing firm. Kept 250 employees up and running on Windows 10. Handled trouble tickets 25% faster than other desktop support engineers. Commended by management 3X for exemplary troubleshooting skills. That's more than just a resume skills list. It's Katniss Everdeen with a computer science background. Can you see how it would impress the manager who hires tech support specialists? Need an IT support technician resume skills list to get started? See below. This desktop support resume skills list should give you a head start. It's packed with great desktop support resume keywords to boot. Find more in desktop support job descriptions online. Use the plan above, and your resume for desktop support will be clicking along smoothly in no time. Pro Tip: Even resetting passwords makes a good desktop specialist resume skill. List anything that proves you have already done the job they're hiring for. Do you need a certification on a desktop support engineer resume? If yes, which one? MCP? CompTIA A+? ITIL? MCSE? HDI? On an experienced resume for desktop support, certifications are like Christmas ornaments. They look nice, but they don't matter all that much. In a face-off between entry-level applicants, certifications can give you a valuable edge. If the job ad lists one, that one's best. Failing that, they're all OK.
You can also put certs in your resume summary, or after your name. A CCNA is generally an IT certification. That said, it does look great on a desktop support technician resume. Pro Tip: An A+ cert costs over $400 for both tests. You could save the time and money and just work a little harder on your desktop support resume. Imagine the hiring manager has just 10 resumes left. How will he pick one? He'll pick the candidate he likes the most. So, how do you become that candidate? With special "other" sections on your pro desktop specialist resume. Hey, it takes all kinds. Still, you'll rope in more interviews with accomplishments that fit the job. That's a true tech generalist. I would ask her anything, including how to reboot the Hulkbuster Armor. But with a little head scratching, any applicant can have a computer support technician resume like that. Pro Tip: Even imaging a PC can make a good bullet point in a resume for desktop support. If you've got space, add anything that proves your worth. How About a Cover Letter for Desktop Support? Will anyone really read a cover letter for a desktop support position? If it says, "Blah blah, here's my resume," they'll toss it. If it's personal and passionate, they'll slow down and give your desktop resume a careful read. First, learn the hiring manager's name and use it. That's the best way to start a cover letter. Then, prove you understand the job, and prove you've got the skill to do it. A position at StratosTundra Digital is exciting to me, because of your commitment to streamlining the IT process. At ArcSpan Media, I saved 50,000 hours of productivity a year by spotting a widespread computer issue. I also resolved trouble tickets 35% faster than the company average. It's this thirst to elevate the desktop support environment that I think makes me such a good fit for this job. End your cover letter with a request. Use something like, "Can we set up a time to discuss speeding up trouble ticket resolution by 20% at StratosTundra Digital?" Pro Tip: Got a knock-em-flat achievement? Put it early in your cover letter. Don't have one? Start with something you love about the company instead. It's easy to put contact info on a simple desktop support engineer resume, right? But also, show a fully optimized LinkedIn address. Recruiters love LinkedIn. Over 87% use it in the hiring process. Pro Tip: Don't let that political rant from 2014 sink your good desktop technician resume. Clean up your social media profiles instead. Stress your work accomplishments. Your desktop support specialist resume should show how you've reached company goals before. Make sure your achievements fit the job description. That'll link your computer support specialist resume to the job like a router to a local network. Use add-ons like volunteer work, conferences, and publications in a resume for desktop support. They'll show you're more than just a clever bot. Do you have questions on how to write a great resume for desktop support? Not sure how to describe your skills or achievements? Give us a shout in the comments! Let's get the conversation rolling! 30 best computer skills for your resume in 2019. What software skills do employers want to see on resumes today? This list can get you get hired faster.